Phase 1: Over 2500 EasyMails Sent! Phase 2: Phone your MLA! Phase 3: Postcards with a View! The new requirements of the Alberta School Act due to the passing of Bill 24 have resulted in confusion, tension, and a healthy fear of what the future holds for Reformed education as we have come to know it. As our Alberta Manager Ed Hoogerdyk said in his Lethbridge Herald article, “For many parents the school year started on a sour note.” The latest series of communication from Alberta Education gives an even stronger indication that the government is unwilling to back down on their demands that every school adopt a Safe and Caring policy that includes language dictated by the government. If demanding that Reformed schools adopt terms like gender identity, gender expression, and sexual orientation, as well as the requirement to allow gay-straight alliance clubs wasn’t enough, the Alberta government is now telling Reformed schools to remove all references to the Lord as the true source of wisdom, and the infallibility of Scripture! Here follows several screen grabs from a recent letter sent to a Reformed school. To be clear, we must always respect and pray for our government leaders. But we must also hold them accountable. This government is driven and committed to an ideology that is a direct attack on God. We need to take a stand and make it clear that it is our Christian duty but also our legal obligation to raise children as we deem necessary. The Bible commands us to do this and our Charter of Rights and Freedoms allows us to do this. Gideon and his small band of 300 men must have felt lonely and overwhelmed. Who could blame them? They were facing an army of one million Midianite soldiers. But through Gideon, God demonstrates His power and sovereignty. In one night the great kingdom fell. God uses average citizens just like you and me to “demolish arguments and every pretension that sets itself up against the knowledge of God” (2 Cor. 10:5). So, take a stand. The third stage of the Gideon Project is called Postcards with a View. We’re asking you to send a handwritten postcard to your MLA. We have provided a resource for you called Postcard Pointers that has talking points on the issue. 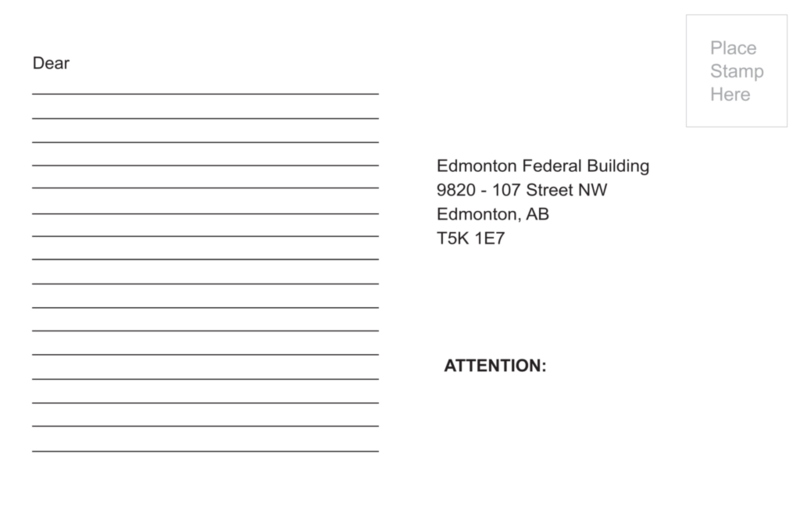 Please use these talking points to write a clear and concise message on a postcard and send it to your MLA. An example of a postcard message has been provided for you. Postcards were provided to those who attended our fall tour. However, if you were unable to get any postcards, please contact Ed Hoogerdyk at [email protected]. Feel free to ask for postcards for your family and friends! This is a great way to get our grassroots of all ages engaged! Thank the MLA for their service to Albertans. Thank the MLA for doing their part in promoting safe and caring schools. Christians do not tolerate bullying because it violates the command of God. Christian schools have policies that are superior to the ones imposed by Minister Eggen; accountability results in independent Christian schools surpass the provincial average. Minister of Education is imposing his own policies on Christian schools, failing to accommodate a diversity of approaches to eliminating bullying. Minister Eggen is denying parents their fundamental right to love and protect their children within a community consistent with their religious convictions. Protect all students. No special protected groups are necessary, lest it privilege some kids over others or turn a blind eye to other forms of bullying. 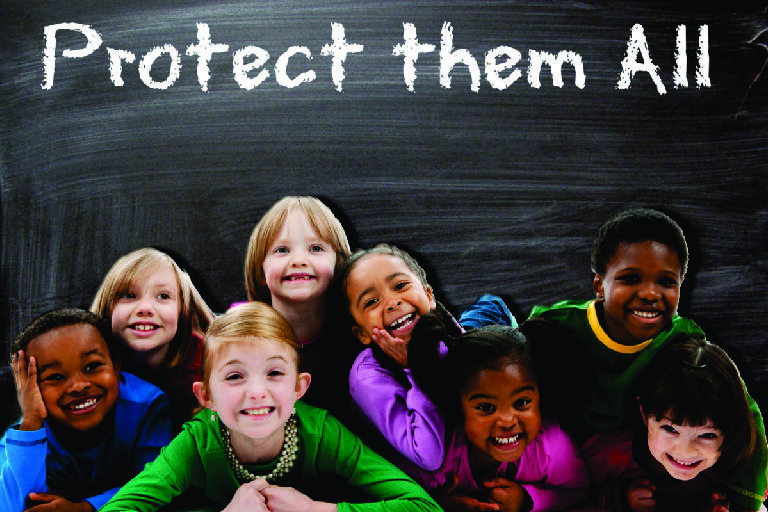 Every individual child must be protected completely and equally. Minister Eggen’s policies are inferior to Christian school policies in this regard. Each student is identified as being made in the image of God and included in the Christian community. Minister Eggen’s concepts of “inclusion” and/or “tolerance” pale in comparison to these rich theological truths. Allow Christian schools to protect all students in a way consistent with their faith. The minister should only be concerned with the outcome (safe schools). He should accommodate a diversity of approaches to achieving that outcome. Thank you for your role in promoting safe and caring schools. 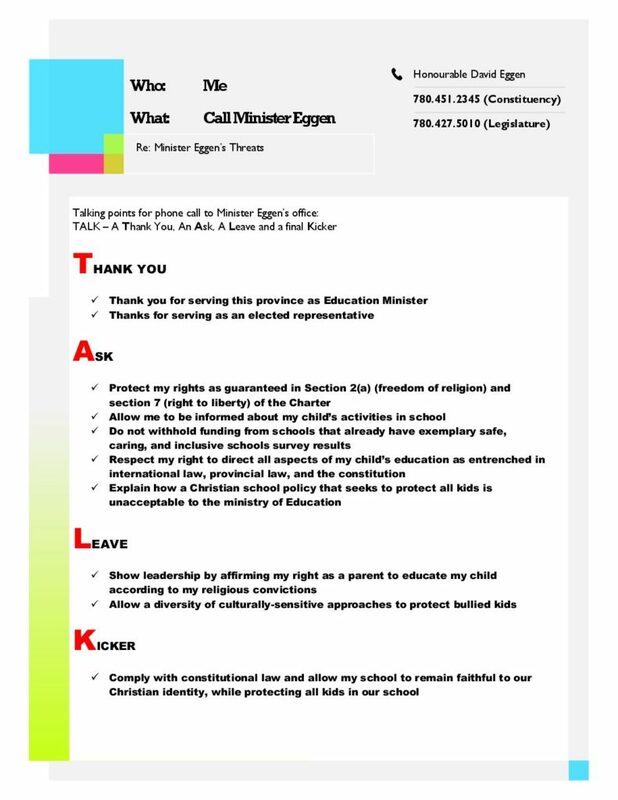 I would like to make you aware that Minister Eggen is imposing policies on Christian schools and denying their religious rights. Christian schools do not tolerate bullying and have safe and caring results that surpass the provincial average. Christians believe that all students are created in the image of God. Therefore, allow Christian schools to protect them all. Thank you for your consideration. 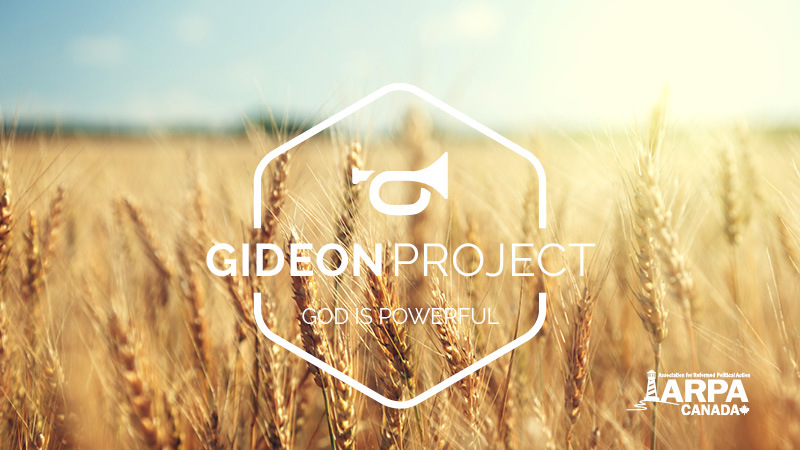 We’ve launched phase two of the Gideon Project. We’ve got a sticky note for you with talking points and everything else you need to call the Honourable David Eggen. Please participate in this phase of the Gideon Project and boldly proclaim that parents have a God-given and Charter-protected right to assume the primary role in raising their children. I don't live in Alberta, what can I do? Note: this call to action is for Alberta residents. If you are from other provinces we encourage you to pray for Alberta and also remain vigilant, as there has been and will continue to be similar pressure elsewhere.